We lay my 92 year old Grandfather to rest tomorrow morning. My grandmother passed away one month ago and he was recently overheard sharing with a nurse about his desire to go to Heaven and be with the love of his life. A few weeks later he was granted his wish. They were truly an example of a Godly marriage. For 62 years they raised four boys together, pastored several churches, and supported and prayed for eighteen grandchildren and 25 great grandchildren. Together they modeled the fruits of the spirit towards anyone who was privileged to know them. In remembering their final days, I’ve often wondered whether or not we’ll be reunited in Heaven with our spouses someday. Although I do believe we’ll be reunited with them as individuals, I don’t believe we’ll hold the same spousal relationship there as we do here on earth. 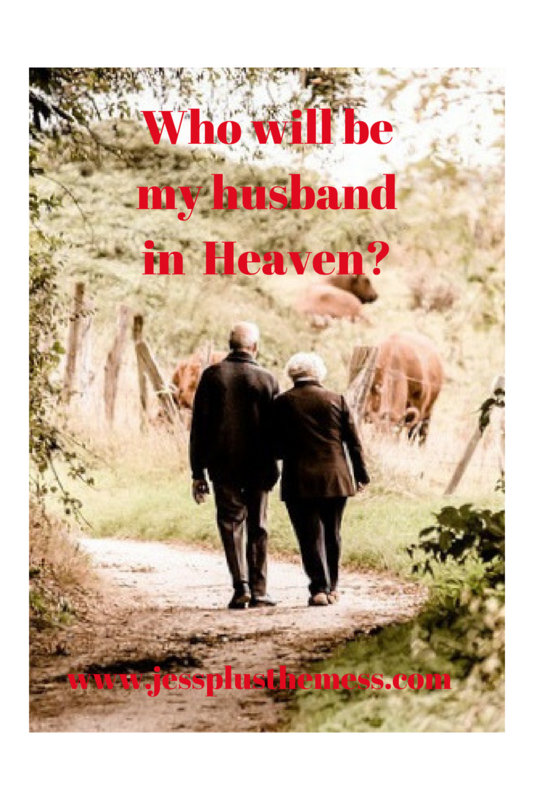 First, from a human perspective, there is some jealousy that arises when I think of my current husband being reunited with his first wife in Heaven while I remain on earth, alone and missing him. Secondly, who would actually be my husband when we all made it there together? Would I have to pick who I wanted to spend eternity with? Current husband Ryan or late husband Jason? Would they duke it out for my hand in marriage? Or would neither one of them want me at that point? The whole situation could get a bit awkward. Although it’s a romantic thought for some, for others of us, in situations similar to mine, it’s a pretty horrific thought! It seems like the perfect scenario to incur anger, jealousy, and bitterness – not traits I imagine being present in Heaven. A few things stand out to me about these verses. In both verses our resurrected bodies are compared to being like and equal to the angels. In neither verse do we hear that we become angels as so many people would like to believe when their loved one dies. How often do we as a society say something like, “Oh she’s an angel looking over you” or “You’ll always have an angel watching you from Heaven.” These verses clearly state that this is not the case. Our new bodies will resemble something like the angels, and perhaps this was the clearest example Christ could portray for our frail human minds to understand and comprehend. Secondly, I find it interesting that Luke states that when a person is resurrected from the dead, they are neither married nor given in marriage anymore, because they cannot die anymore. What is it about the fact that because we cannot die anymore that leads to the lack of a need for marriage in Heaven? Christ compared a Biblical marriage as one where the husband is the head of the wife just as Christ is the head of the church. Husbands, love your wives, as Christ loved the church and gave himself up for her Ephesians 5:25. This is what is portrayed Biblically as the premise for a Godly, loving marriage here on earth, one in which the husband lays down his life for his bride, dies to himself and his own selfish ambitions, sacrifices for her, and loves her and in return, the wife, like the church of Christ, seeks to honor, respect, love, cherish and obey her spouse out of the love that he pours out upon her, She does him [husband] good, and not harm, all the days of her life. Proverbs 31:12. It is this dying to ourselves concept that we see portrayed in this example of marriage. Marriage is no longer required in Heaven because the institution will be fulfilled completely through Christ and his relationship with the church. So it really doesn’t matter who will be my husband in Heaven. I will be so filled with the love of Christ as my bridegroom and part of the resurrected church, the most beautiful bride ever, that I will have no need for spousal love; for Christ’s love will fill every aspect of that love that earthly need just as I believe wholeheartedly that both of my grandparents are experiencing right now. Jessica…I don’t know you…but I think we could be great friends. I, for the life of me, can’t remember how I stumbled across this blog…but I’m glad I did! What a wonderful example of marriage your grandparents were! Heaven is all about God, not us. I don’t believe we will be reunited with past loves in that way and it won’t matter because our “role” in Heaven will be to worship God in all his glory, not worry about who was married to who. But if you believe, as do I, that marriage relationships continue in the next life, then you’ve got a dilemma on your hands. That would be problem Abel, I guess your wives can duke it out for your hand in marriage when you all get there:-) You should post on that, I would be interested in reading your take and mg’s take on that concept! Yes! In the Old Testament, when a person died, the biblical writers said he was “gathered to his people” (cf. Gen. 25:8; 35:29; 49:29; Num. 20:24; Judg. 2:10). In 2 Samuel 12, when David’s infant child died, David confidently said, “I shall go to him, but he shall not return to me” (v. 23). David evidently expected to see the child again–not just a nameless, faceless soul without an identity, but that very child.The New Testament indicates even more clearly that our identities will remain unchanged. While sharing the Passover meal with His disciples, Christ said, “Take this [cup] and divide it among yourselves; for I say to you, I will not drink of the fruit of the vine until the kingdom of God comes” (Luke 22:17-18). Christ was promising that He and His disciples would drink the fruit of the vine together again–in heaven. Elsewhere Jesus makes a similar, but even more definite, promise: “Many will come from east and west, and sit down with Abraham, Isaac, and Jacob in the kingdom of heaven” (Matt. 8:11).Furthermore, Moses and Elijah appeared with Christ on the Mount of Transfiguration. Even though they died centuries before, they still maintained a clear identity (Matt. 17:3)–Peter, James, and John evidently recognized them (v. 4), which implies that we will somehow be able to recognize people we’ve never even seen before.All the redeemed will maintain their identity forever, but in a perfected form. We will be able to have fellowship with Enoch, Noah, Abraham, Jacob, Samuel, Moses, Joshua, Esther, Elijah, Elisha, Isaiah, Daniel, Ezekiel, David, Peter, Barnabas, Paul, or any of the saints we choose. For that to be possible, we must all retain our individual identities, not turn into some sort of generic beings.Describing the Lord’s appearing and the resurrection of the saints who have died, Paul writes, “Then we who are alive and remain shall be caught up together with them in the clouds to meet the Lord in the air. And thus we shall always be with the Lord” (1 Thess. 4:17).Paul’s purpose in writing was to comfort some of the Thessalonians who evidently thought their dying loved ones would miss the return of Christ. He says in verse 18, “Comfort one another with these words.” The comfort comes from the prospect of reunion. Little comfort this would be if in the reunion we could not even recognize one another. But Paul’s promise that we will all be “together” forever implies that we shall renew fellowship with all whom we have known.We will be reunited not only with our own families and loved ones, but also with the people of God from all ages. In heaven we will all be one loving family. The immense size of the family will not matter in the infinite perfection of heaven. There will be ample opportunity for close relationships with everyone, and our eternity will be spent in just that kind of rich, unending fellowship.If you’re worried about feeling out of place in heaven, don’t. Heaven will seem more like home than the dearest spot on earth to you. It is uniquely designed by a tender, loving Savior to be the place where we will live together for all eternity and enjoy Him forever–in the fullness of our glorified humanity.Is it any wonder that the psalmist said, “Precious in the sight of the Lord is the death of His saints” (Ps. 116:15)?Adapted from John MacArthur, The Glory of Heaven (Wheaton, IL: Crossway, 1996), 138-41.
from my understanding there is no jealousy in heaven…im thinking that people who get married more than once will be reunited and live together in heaven without being jealous to each other. I believe when we die we will continue to be in the family we raised here on earth. How it works out if you married a widower or widow I have no idea. What I do know is ; in the end all things will be made right by God. Have you ever read “Heaven is for Real” ? It’s about a little boy who clinically died but “came back” and he saw his grandpa and sister who had been a miscarriage. People had wings. He was only four so they asked him questions that they knew he would never know the answer unless he had really been there. It’s an amazing story. Everyone will be about 35 years old at their oldest in heaven. (I’m remarried previous widow) The bible says no one will take a bride or be given as a bride. Meaning no one will GET married in heaven. So, perhaps we ARE married in heaven. Based on that thought: As for remarried widow/widowers, if there is marriage in heaven, they will be with their most recent spouse. When a person remarries, they terminate their previous marriage. Like a divorce. The death of the spouse doesn’t end a marriage, but the new marriage does. Forsake all others!! dead or alive!!. So, if your want to be with your spouse in heaven, don’t remarry after they die. In my studies on the subject I have come to believe that while we won’t be married because our marriage to Christ will be enough, we will know our spouse and our good memories will remain. Of course we will love everyone but we will everyone uniquely and infinitely and our relationship with our spouse although lacking earthly intimacy will be better and more complete than we could have imagined on earth.